Back in March I ordered new beds for both of my chicklets. 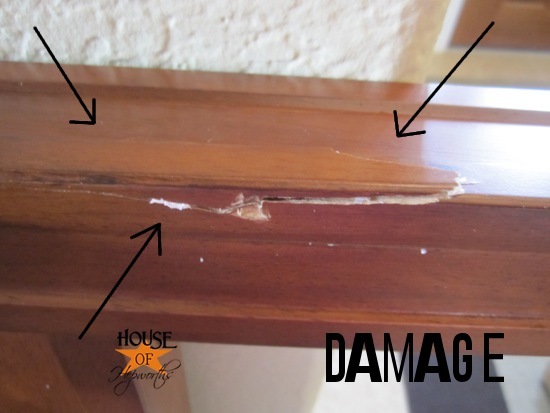 In the shipping process several pieces of the beds were damaged. I was frustrated but the company fixed the situation and sent out new pieces. *You asked, I edited! The bed is from Hayneedle. All bed info can be found here or here. They told me to just throw away the damaged pieces. It would cost more money to send them back than was worth it. What I was left with was a complete set of damaged and mismatched pieces that, when combined, created another bed. Instead of tossing them out I saved them with the intention of fixing and refinishing them to put in our guest room. After months of putting off dealing with the damaged and mismatched pieces, I finally got the itch to finish them. The first thing I had to do was fix the damaged pieces. The front right leg was the worst of the damage, with a huge splinter from a forklift cramming into it. To fix the leg I removed the huge splinter section, sanded the rough spots on the leg and the splinter chunk I removed, then glued the splintered chunk back in place. I added two very tiny finishing nails to help hold it in place. After that I filled the entire section with wood putty and waited for it to dry. A final sanding made the leg good as new. 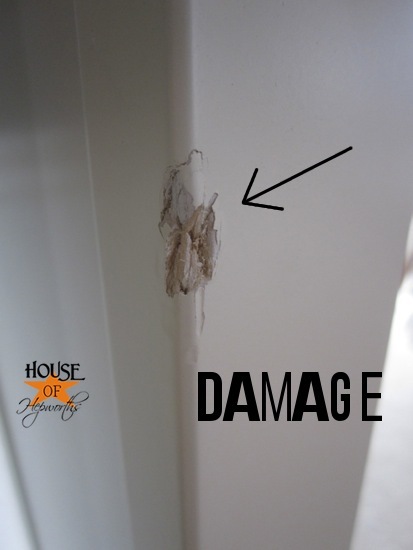 I also used wood putty to fix all the other damage on the bed then followed up with sand paper. Once the repairs were made I wiped down the bed pieces really well with a dust cloth and a damp rag. 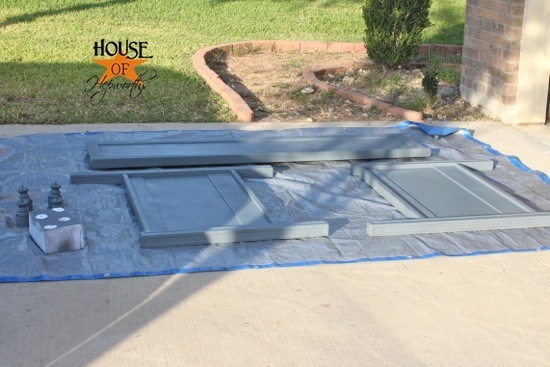 Then I gave each section two even coats of gray Rustoleum Primer spray paint. I used 4 cans of Primer for the entire bed. It took me awhile to paint everything because I had to wait for the fronts to dry before I could flip them and do the back sides. I then left them in the garage for a few days just to let the primer really cure and set into the bed. Finally it was time to paint! 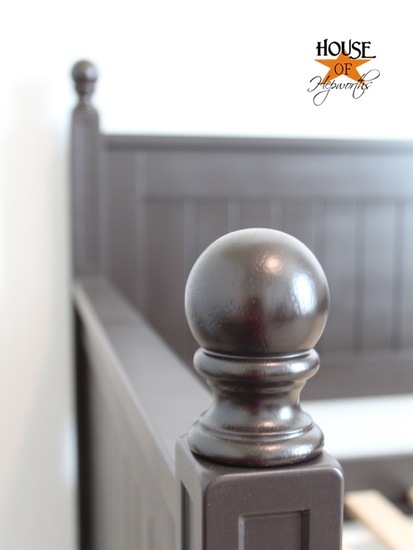 I chose a color called Dark Walnut from Rustoleum. When painting furniture I like to use a satin finish. The gloss is too shiny. 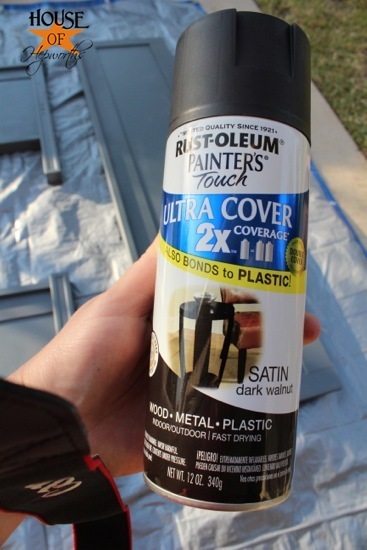 This Ultra Cover 2x Rustoleum is my favorite type/brand of spray paint. (I am not affiliated with Rustoleum. I just like their stuff the best.) Oh, I used 4 cans of spray paint for the entire bed. Each bed piece got several thin even coats and plenty of dry time before flipping them over to tackle the opposite side. I definitely win the white-trash-award on our street. I spray painted the bed on top of tarps and garbage cans in the driveway. In my pj’s. The neighbors are all super impressed with my many creative uses for garbage cans and camping tarps. 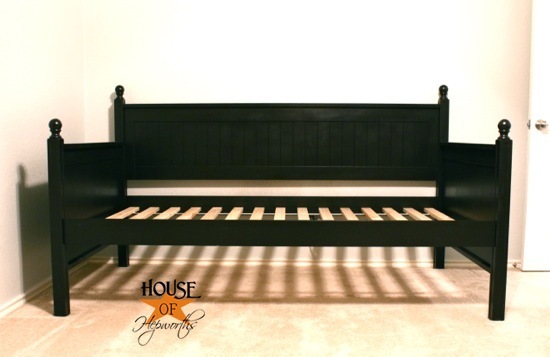 After several days of the hurry-up-and-wait game, the bed was finally painted and ready for assembly. It looks splotchy but that’s just a glare from the light in the window. 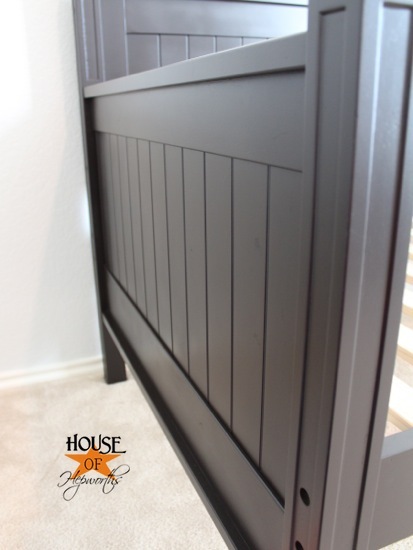 In some light the bed looks black, but in other more natural light you can definitely see a dark brown hue. I think the color is perfect. It’s not as harsh as black, but still gives off that dark blackish vibe. And in case you are wondering how that damaged leg turned out, from this side angle you can just barely see a hint of damage. From the front view it is seamless. I am sharing my office with the guest room. 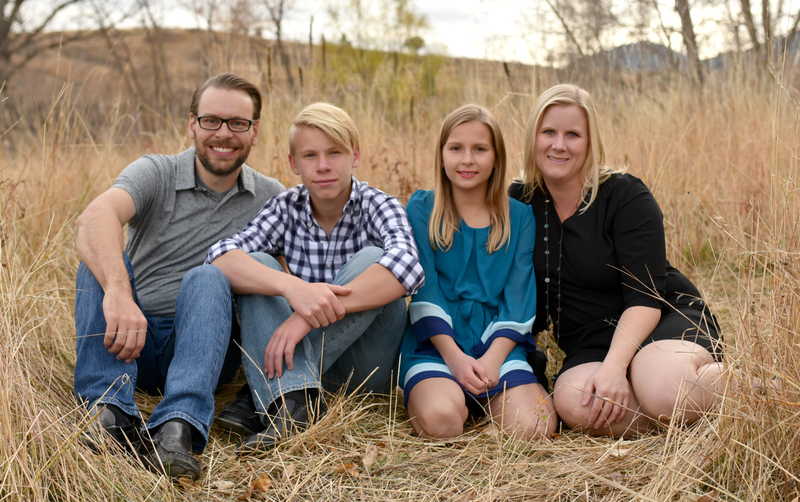 I hardly ever use my office, and most of our family lives local so we don’t have many guests. It’s a win/win. We still need to get a mattress. 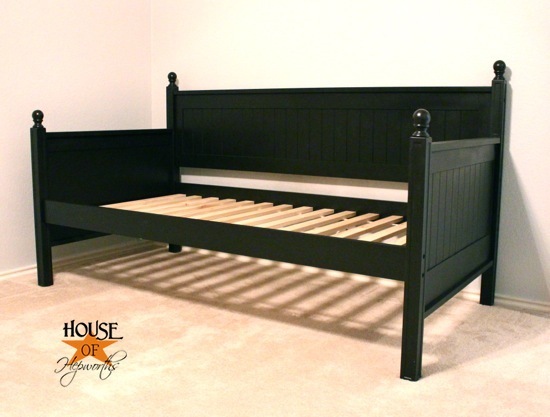 I’m also going to either purchase or build a trundle to go under the bed so we have two twin guest beds. That way if a couple comes to stay they can at least each have a bed. We’ll just pretend it’s 1940 and all couples sleep on separate guest beds. Speaking of, did you see that episode of How I Met Your Mother where Marshall and Lily decide to get separate beds? That show is one of my favorites. It’s so hilarious. I also totally lucked out with the back-to-college stuff at Target. 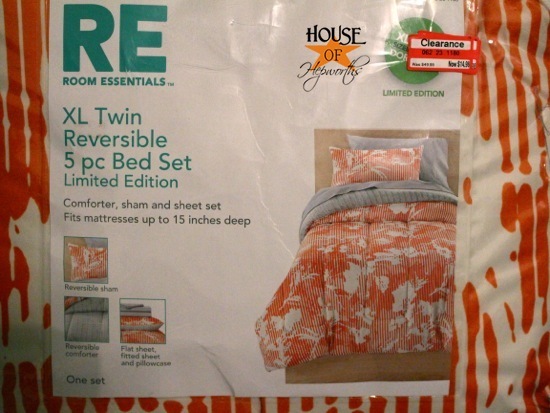 I found two matching twin bedding sets on clearance for less than $15 each. Score. They are a full bed-in-a-bag so they come with everything you need; sheets, shams, comforter, pillow cases. 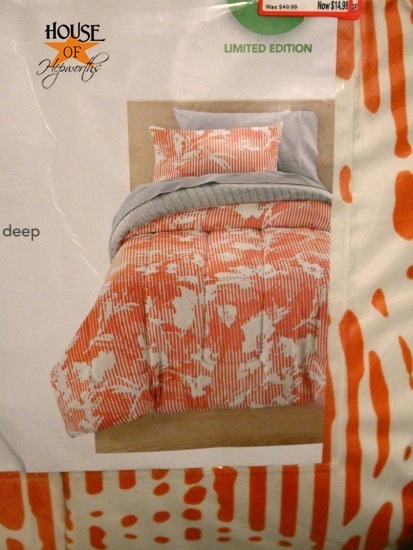 Of course, when I saw two matching sets on clearance (one for the bed and one for the future trundle) and that they are orange and gray (my favorites!) I swooped them right up. Now I just need to get some mattresses and we’ll be set. Anyone know where I can get really good comfy mattresses for super cheap? 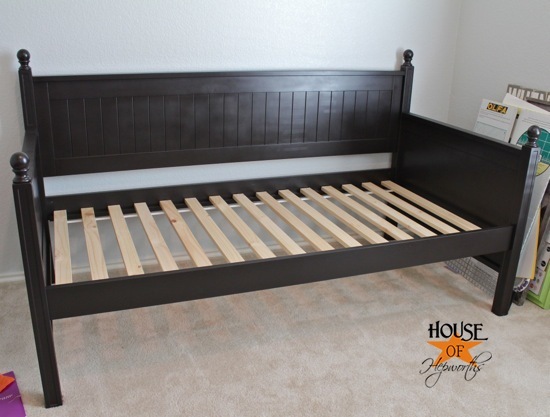 I was pretty ticked when both my kids beds came totally damaged, but am glad to report a very happy ending. I basically got a 3rd free bed for my inconvenience. I’ll be inconvenienced any day for a prize that nice. In total I spent about $30 on spray paint, which is still way cheaper than buying a bed. Love it. Have a great weekend! Happy Friday. You knew it would be asked…where did you order the bed from? It’s simple but very cute. I’m looking for a twin for our play/guest room. I see you have already covered the beds. Sorry! I am a new reader and haven’t caught up on the archives yet 🙂 . I love that episode! And there’s a type of trundle that actually pops up. You can use it as two twin beds, or pop up the trundle and the couple can sleep next to each other, though I definitely wouldn’t recommend sleeping in the middle! I’ve seen them for a few times on Craigslist in my area. Great tip! I forgot about those. I will have to check them out for sure. And no, I wouldn’t want to sleep in the middle. Ha! I recently bought my son two twin matresses for his boat bed & trundle. Most places only sold the matress & boxspring as sets. I ended up buying the matresses only at Big Lots of all places. They are Simmons mattresses for $99 each & super comfortable. Thank you for this tip! I have a big lots near me, I’ll head over and check them out. I second Big Lots for buying a mattress! One tip…. Every 6 months they send out a 20% off coupon for your entire purchase! Get on their mailing list and print out the coupon from the email! Just make sure you go on the first day the discount is available, as early as possible. Everyone else buys them that day too! Oooh, great tip! I will get on their mailing list asap!! I’m a bit jealous of all the amazing deals you get at Target. That’s awesome!! I am a Target shark. I go at least once a week and make my clearance-rack rounds. I don’t buy much there unless it’s on clearance. If you go enough and you figure out all the clearance locations in the store you can find killer deals! I can get in and out of a Target in about 10 minutes, so I will just pop in randomly to quickly check the clearance items. The damaged bed look very good after you painted. I will try to do it on my furniture.Thanks for sharing this info post. allison that is my ABSOLUTE ALL-TIME favorite brand and color of spray paint!!! i have to use force to keep myself from painting every single thing i am DIYing that color or my home would be one big walnut blah!!! LOL it looks great on that bed! It’s the first time I’ve used this color, and I have to say, I really love it! A lot. Almost as much as my old faithful – good ol’ ORB. Fantastic!!! 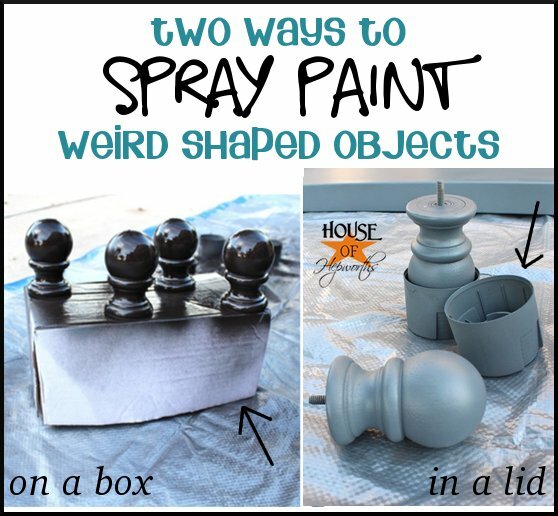 I also paint in my PJs in my yard and neighbors think nothing of it….great advice and tricks for spray painting. wow that is amazing, and what a good company that they did that, I love when companies treat their customers well. Okay, you are amazing! That bed looks perfect. Who would have thought getting a damaged product could turn out so well? We got my daughters twin mattress at Costco, they have really good deals on mattresses pretty often. I was going to buy one, but apparently they only have them seasonally?! Do you know what time of year they get their mattresses in? Mattress sources: Costco/Sam’s/BJ’s and sometimes the smaller stores like Original Mattress Factory (do you have them in Texas?) 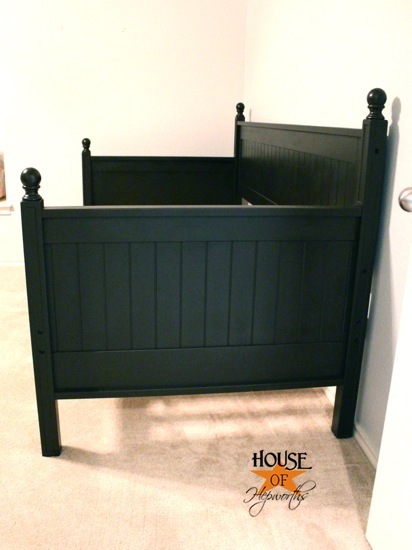 Speaking of Texas and separate beds…. Shortly after my parents were married they discovered that they could not sleep in the same bed – Mom a very light sleeper and Dad a very violent sleeper – and being newlyweds with no money, they bought two sets of twin matteresses and box springs used from a friend of my Grandmother’s who apparently barely used them (reduces the ick factor). That was in 1961, and my Mom still has them in her room and sleeps on hers (Dad passed away some time ago). I flopped down on my Dad’s the other day and almost fell sound asleep, the thing was so stinkin’ comfortable. Can you imagine any mattress made today lasting that long? Mine is a hot 5 years old and already killing my back. Oh – these fabulous mattresses came from Lubbock – maybe you could check the Craigslist in Lubbock for 50 year old mattresses? Haha. Wow, that is crazy. Stuff is not made the way it use to be made. I have an alarm clock that I still use daily from about 1987! And the thing just won’t die. Mattress Source – Costco! My husband and I got a queen memory foam mattress for just over $300, including tax and shipping. We have seen the same mattress elsewhere for $500+. GORGEOUS!! I had to laugh at your painting in the driveway and using trash cans! lol I use buckets, trash cans, saw horses…whatever I can find. Fortunately, my neighbors don’t have to look at me as I can do this in the back yard! lol I look like the wrath when I’m working on furniture. I’m thinking I’m headed for canned spray paint -LOVE that color! I’m not being very successful with the ‘industrial strength’ spray painter at my house. Amazing score, my friend!! Funny how we’ve never met, but I think of you as my friend. I’m sure we would be friends if we ever met! I used to use boxes to spraypaint small stuff like screws and knobs. However, I have found that styrofoam works way better! It’s easier to poke the stuff into and it holds it better. Plus, styrofoam isn’t something I could normally repurpose, so I don’t feel bad spraypainting it. Bummer about the damaged bed, but it’s awesome you were able to fix it and get a free bed out of the deal! It looks great now and I love the bedding you got! Walmart has good prices on mattresses. I got a queen memory foam for like $250. Twin would be cheaper I’m sure. For larger FLAT items–like cabinet doors or room doors or planks—that need both sides done—take either a similar size item or piece of plywood and get some sharp finishing nails—sharpen with a file if need be when done–and drive them thru from the BACKSIDE of the wood so they protrude a few inches–enough to get your fingers under and give air room to circulate. You can also use several boards with these same type nails –then you can use for multiple projects of differing sizes. Sharpen the pointy ends of the nails. This is done to make the smallest possible area of “contact” between the painting project and the support piece. 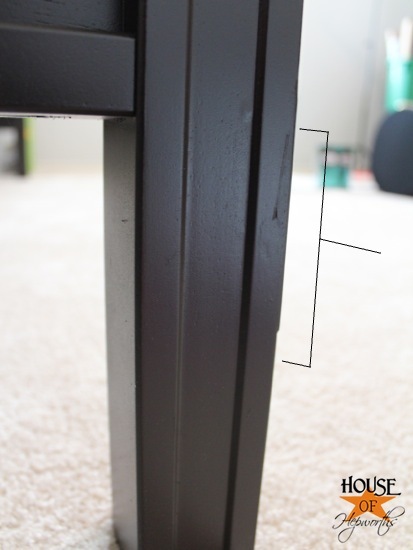 Set the item to be painted on the support piece ON THE POINTS! Back side UP. Paint. Paint the BACK SIDE FIRST. Let set up but does NOT need to dry. CAREFULLY TURN THE PAINTED PIECE OVER and set down gently on the pointy nails. Do the top side. Let dry. 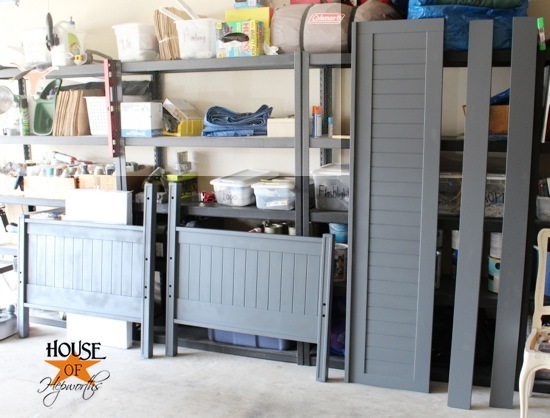 For a multiple surface project like kitchen cabinets make a few of these and see if there is a way to do a “pattern” to the pointy nails to make the best use of the scrap wood and where the points “touch” the painted surface. For a larger project either use a similar size piece of plywood or several boards spaced to support the entire door or panel. For smaller multi surface items like finials or furniture feet you can take a small scrap of wood and drive several nails so that each side can be turned and supported as you paint and move the item to get at all sides. You might need some longer or a pattern if you are doing many of the same shape. 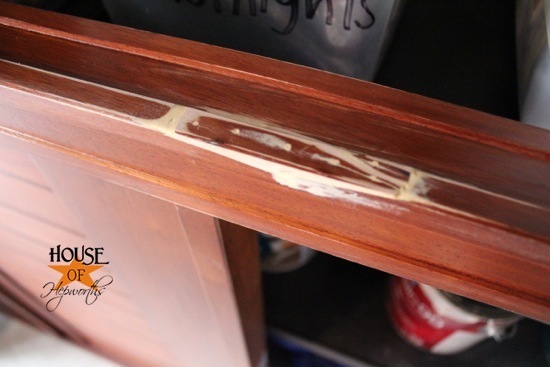 Also a good way to paint frames—edges won;t get drippy if careful this way. For odd shapes in wood or solid material you might be able to either use fishing line looped around the screw base or if the item has a plastic insert; or use a small cup hook screwed in a turn or two to suspend in front of a cardboard back drop–a corner of a cardboard box makes a good “spray booth” for this. Those disposable styrofoam cooler boxes come in handy for these sorts of things too—you can screw right into the inside of the box and spray away and re-use or toss. People who get medical supplies like insulin get these in the mail or ask at your markets fish section! You can use toothpicks or skewers or sturdy straws for propping too. Just make sure the paint doesn’t drip or “pool” on the holders. And make sure you at least move them to a new location on the points if the pain looks like it might “grab” at the intersection of point and object! 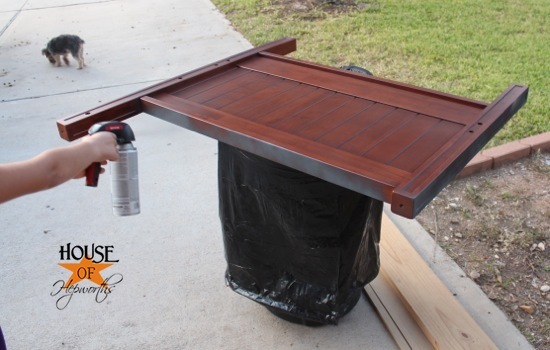 IF you are getting into painting lots of small spray painted items–at one gulp or just something you think you will do a lot of repeatedly—it would be worth your while to rig up a small “Paint Booth” from sturdy cardboard and heavy plastic sheeting–think painters heavy plastic tarping—and a small FAN vented to the great outdoors. Just make sure this vents to the BACK or the TOP if your work area –you can use a piece of aluminum conduit or dryer venting and snake it to the garage door or a window for temp use–if you are lucky enough to live where it is relatively warm most days you could just use a piece of plywood to place in the bottom of a basement or garage/workshop window and have your fan vent into that—just make sure you have a piece of screening on the end to prevent creature visits! You could make this so that you could take it in and out also. An old kitchen vent fan works for this sort of thing. Or one of those $9.99 Wallyworld desk top fans would work too and you could take off the grid if it was not going to be near hands. 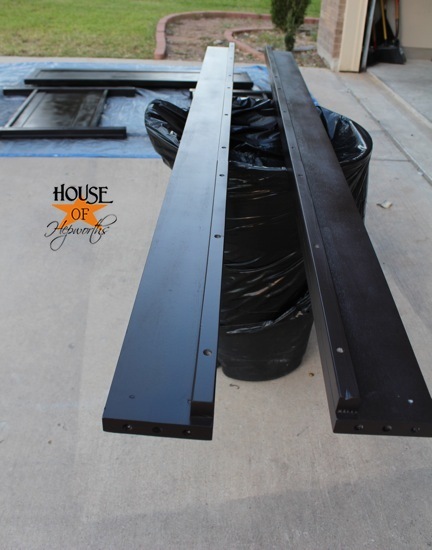 PS–I HAD that same back door with the glass insert pre-finished in HUNTER GREEN ENAMEL and it did look like the outdoors was framed–alas it was too heavy for the hardware and it also closed the wrong way. Still sitting here waiting for some other use! It also had a lovely brass “kick plate” on the base that I really liked–prevented chips and gave it a nice finished look. Sigh. And the darn thing was FREE!!!!!!! hi! 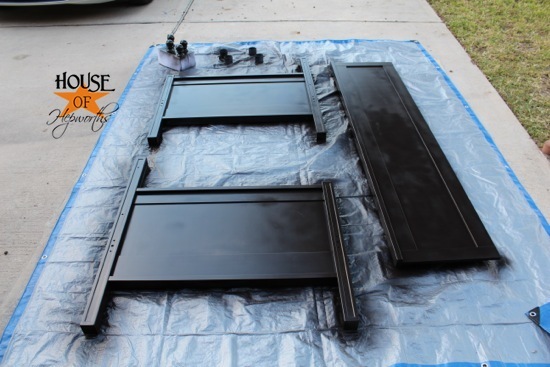 i am totally in the process of spray painting my boy’s twin size bed. 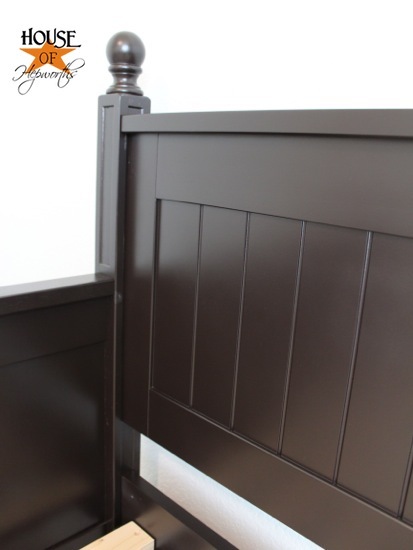 it’s currently a honey oak hue right now but i have wanted to paint it a dark brown hue- looks like your dark walnut came out really well which may be the color i’ll end up picking out! i also want to spray paint the matching night stand and dresser! whew! you said it took days to get the bed done because of the turn-around on drying and letting the paint set in. if i’m doing a twin size bed + tall dresser + night stand, am i completely insane to try and tackle all that? and would 1 week be reasonable enough to do it? thanks for all your posts!